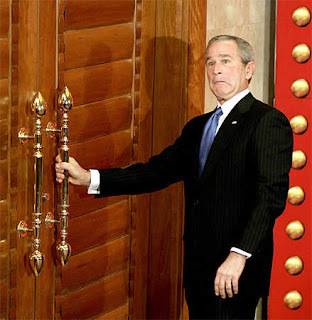 Arabdemocracy: When Bush is gone.Will reason prevail? The US policy towards the Middle East after 2008 presidential election is one of the most important questions political analysts around the world are trying to answer. Below, an excerpt from an article from “Time to Ignore the Middle East?”, by Leon Hadar published last June on the IRC ( International Relations Center ) website provides us with some useful insight. These days, conventional wisdom in Washington , DC holds that the Iraq War has been lost, that the Bush Doctrine of promoting unilateral regime change and spreading democracy in the Middle East has failed, and that the neoconservative ideologues who have dominated U.S. foreign policy since 9/11 are "out" while the realists are "in." But the same conventional wisdom says you shouldn't hold your breath—even if an anti-war Democrat wins the White House in 2008, don't expect a revolutionary change in U.S. policy on the Middle East . In the best-case scenario, some U.S. troops would probably remain based in Iraq, and certainly in other parts of the Persian Gulf, as a way of demonstrating U.S. resolve to defend Saudi Arabia and the other oil-producing countries in the region; Washington would still maintain its strong military and economic support for Israel and try to mediate another peace process. If anything, the election of one of the three leading Blue candidates, Sen. Hillary Clinton, Sen. Barack Obama, or former Sen. John Edwards, all of whom have little experience in national security, might make it more likely that the United States could be drawn into a military confrontation with Iran as the new White House occupant tries to demonstrate that he or she is "tough." Hence, under either a Democratic or a Republican president, one should not be surprised to discover that the major element in the neoconservative agenda—maintaining U.S. military and diplomatic hegemony in the Middle East—will likely remain alive and well, producing the never-ending vicious circle: more U.S. military interventions, leading to more anti-U.S. terrorism, resulting in more regime changes. -Creating a new Congress of Vienna system—a concert of Great Powers, a Northern Alliance that will include also the European Union (EU) and Russia , and eventually also China and India —will help contain instability and terrorism. The United States doesn't have the military power and economic resources to do that job alone. Washington needs to replace the concept of a U.S. Monopoly with that of a U.S.-led Global Oligopoly. -In that context, Washington should encourage Europe to play a more activist role in the Middle East , which is, after all, its "strategic backyard." Besides the geographic proximity, Europe is also tied to the Middle East through demographic ties in the form of immigrants. European economies—not U.S. economies—are dependent on the energy resources in the Middle East . It's time for Washington to stop giving Europe a "free ride" in the Middle East and create incentives for them to start paying the costs of maintaining their geo-strategic and geo-economic interests in the Middle East . The deployment of the French and Italian peacekeeping troops in Lebanon is a step in the right direction. -A new paradigm should shape incentives for the formation of regional balance of power systems that include Turkey , Israel , the leading Arab states, and Iran . Indeed, Washington needs to begin adjusting to the reality that Iran will become the hegemon in the Persian Gulf and that its nuclear military power will be counterbalanced by Israel. -Adopt a policy of benign neglect toward the many tribal, ethnic, and religious conflicts in the Middle East . Washington needs to understand that it doesn't have the power to resolve or control all of them, and should engage in the Middle East through trade and investment and providing support to those who want to be allies. But by trying to force a U.S. mind-set and values on the nations of the Middle East, Washington will only erode its power and produce more anti-Americanism.